Memory Module distributor buys module from overseas. He wants to insert his own manufacturer ID and serial number so that he can identify his own inventory. Since he does not want other sellers to falsify his modules, he would use a scrambling algorithm to generate his own unique serial number. These serial numbers cannot be copied easily. SPD auditing is the last step for outgoing quality control. Each outgoing module goes through a barcode scanner to read off its label. 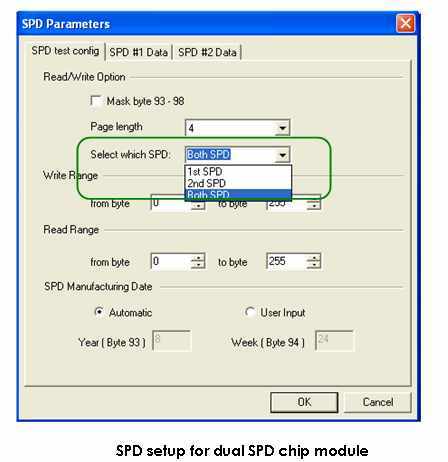 Tester interprets the information on the label and compare against the SPD information on the module for any difference. 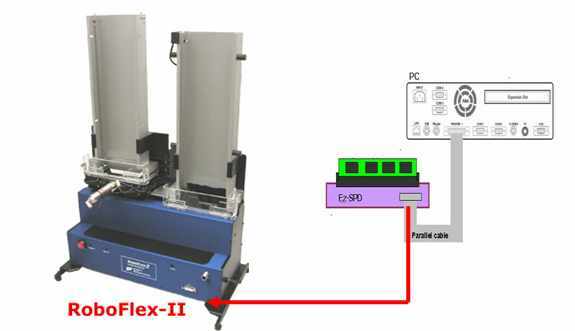 SPD table is also read and stored into the quality control server for future reference. The memory module is heated until the sense line on the thermal sensor triggers. The temperature is automatically recorded into the SPD. Upper and lower temperature limits are set for the module. System Bios automatically learn the thermal characteristics of the module from the SPD data when they are installed in the system. SPD information is obtained from a master file on the company server. Serial numbers are automatically generated. A label with unique serial number and information is automatically printed with barcodes for that module. CST, Inc. provides two separated hardware systems for SPD management. The SP3000 series tester is a functional memory tester with SPD edit, compare and programming functions. The other one is the EZ_SPD programmer, a low cost simple programmer to manage the SPD process. These two SPD programmers all have copy, read, duplicate, and inspection function together with barcode reader interface. In software, CST provides standard routines on barcode scanning, network file transfer interface, reversible write protect algorithm, as well as automatic CRC code generation. With these standard routines, CST can easily assemble and customize software to synchronize with each customer’s production process. CST, Inc. also offers mechanical handler system for fully automatic SPD management. Manufacturers can now leave their SPD programming and auditing to the “just before ship” moment. It is not only labor saving, but also enhance the efficiency and accuracy. In summary: An automatic SPD management system with from CST can help you gather RMA history, Source tracking, and Serial Number Log. It can greatly enhance your profit. Please feel free to call on CST engineers at (972) 241-2662 to discuss your SPD management system requirements.